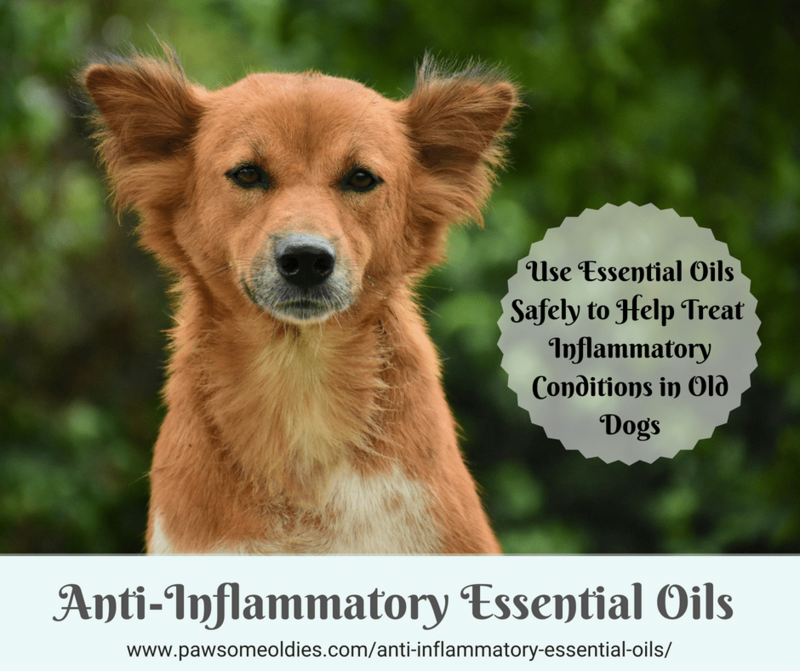 Use anti-inflammatory essential oils to help relieve joint pain, tummy and skin issues caused by inflammatory conditions in old dogs. Our dogs may not like it when they have an inflammatory condition (e.g. pain, swelling), but inflammation actually is a positive bodily response. It means the white blood cells are working hard to fight against whatever foreign substances that have entered the body. In other words, inflammation is a normal body function to protect the body from outside invaders, such as bacteria, viruses, toxins, etc. As our dogs age, their immune systems gradually get weaker. This means older dogs are more susceptible to “invasions” by pathogens. As a result, their bodies have to work much harder to keep these foreign invaders in check, and they are more prone to severe inflammatory conditions. When inflammation is not properly controlled, it will go out of hand and becomes chronic. This could cause other health problems, such as diabetes, obesity, heart disease, cognitive dysfunction (Alzheimer’s), and even cancer. To control symptoms of inflammatory conditions in dogs, many vets routinely use conventional medication such as NSAIDs (non-steroidal anti-inflammatory drugs) or corticosteroids. While NSAIDs approved for use on dogs are generally safe, some dogs do develop the occasional side effects. The most common ones include vomiting, diarrhea, loss of appetite and, as a result, reduced energy. Other dogs may have more serious side effects, such as stomach ulcers, kidney damage, and liver toxicity. Older dogs, with their weaker bodies, are more vulnerable to some of these side effects. Fortunately for our dogs, especially our oldies, there are quite a few herbs, supplements, and even natural foods that have powerful anti-inflammatory properties. We can definitely use some of these natural anti-inflammatory goodies to help a dog’s inflammatory condition. I have written an article that focuses on natural anti-inflammatories for internal use. Please take a look at it here. This post is about using anti-inflammatory essential oils and vegetable oils topically to alleviate some outer symptoms of inflammation. These symptoms could be swelling and pain, itchy skin, skin flare-ups, and tummy issues – all quite common among oldies. If we can harness the anti-inflammatory power of essential oils to help make our oldies feel better, they can enjoy a better quality of life. There are a lot of essential oils that have powerful anti-inflammatory properties, but not all of them are safe for use with dogs. If you are new to aromatherapy, be very careful if you want to use anti-inflammatory essential oils on your dogs. Some such essential oils are quite strong and may cause skin irritations. A few of them may even cause toxicity. 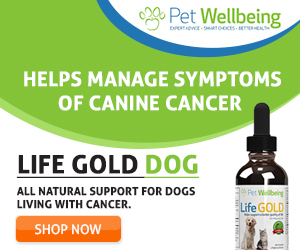 Here you can find a list of dog-safe essential oils and vegetable oils that can be used TOPICALLY to help your dog’s inflammatory conditions. For general safety precautions when using essential oils on older dogs, please read this page. I bet this is what our oldies think every time they get up from their beds, or have the urge to chase after a cat but are held back by their aches and pains! Most dogs after the age of seven develop some form of joint degeneration, and that’s when they start having joint pain and stiff muscles. So, what kind of essential oils are good for joint pain and muscle stiffness? Well, we want essential oils that have pain relieving and anti-inflammatory properties, and can promote blood circulation. Oils with these properties are effective in loosening muscle tightness, soothing muscle pain and spasms, and reducing joint pain and discomfort. When making an oil blend for your dog’s achy joints and muscles, it’s a great idea to use one of these anti-inflammatory vegetable oils as a carrier. A double dose of anti-inflammatory power, if you may! Older dogs also tend to have sluggish digestive systems. That means they are more susceptible to tummy issues, such as gas (yikes!) and more serious GI inflammatory conditions (e.g. IBD, gastritis, colitis). Understandably, inflammatory conditions in the GI tract can cause tummy aches, diarrhea, distention, and appetite loss. The good news is, there are some anti-inflammatory essential oils that are particularly effective in easing GI discomfort and helping with digestion. Older dogs also have weaker and drier skin, which means they tend to feel itchy more often. As such, they tend to scratch, lick, and chew on their skin more. They are more prone to skin inflammation and infections due to the constant scratching, licking, and chewing caused by the itchy skin! Vegetable oils that have anti-inflammatory properties and are particularly skin healing include coconut oil and tamanu oil. Most of us are familiar with coconut oil and its anti-inflammatory and skin nourishing properties. But have you heard of or used tamanu oil ? This oil is extracted from the fruit of Calophyllum inophyllum, which is a tropical tree common in Polynesia. Tamanu oil is anti-inflammatory and pain relieving. Also, it has tremendous skin healing properties. It is excellent for dry or scaly skin, eczema, cuts and burns, etc. In other words, a great carrier oil to use for skin irritation blends! 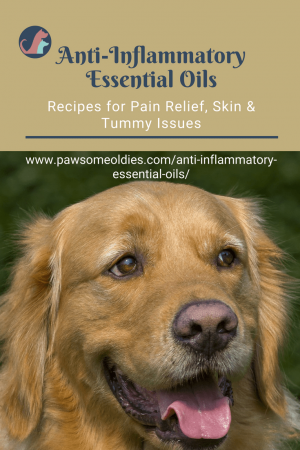 Now that we know which anti-inflammatory essential oils are good to use with dogs, let’s look at some simple recipes that you can make to help ease your old dog’s discomfort caused by some inflammatory conditions. *Trauma oil is an herbally-infused oil blend that combines Arnica, St. John’s Wort and Calendula oils. Trauma oil an excellent carrier for essential oil blends that are made for injury, joint and muscle pain, trauma and healing. In a dark glass bottle, mix the essential oils with trauma oil. Use this oil blend to massage into any stiff joints or muscles that your dog may have. Use this oil blend to massage into any arthritic joints that your dog may have. In a dark glass bottle, mix the essential oils with the carrier oil. Apply this oil blend to affected area(s) 2 to 3 times daily. Apply this oil blend to the dog’s tummy 2 to 3 times daily. As you can see, there are in fact quite a few anti-inflammatory essential oils that we can use to help our dogs. If the pain and/or inflammation is not too severe, very often using something natural (e.g. herbs, essential oils) can do the job just as well as conventional medication. 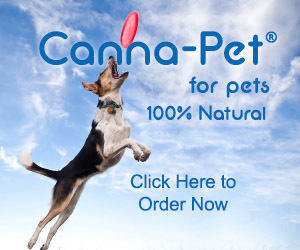 On the other hand, if your dog is in great pain, then of course stronger “ammunition” (e.g. NSAIDs or even corticosteroids for a short period of time) may be necessary. Finally, just wanted to stress that all the blends introduced here are for TOPICAL use only. NEVER give any essential oils or oil blends to your dog orally.